There are two things a quilter requires – a huge stash of fabrics and space to create (maybe a third – a very understanding family). The poor family lost the front room for a greater cause. It has a great view and a chandelier. So posh! 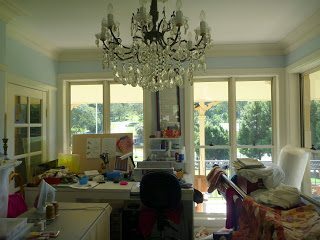 One day, when I win Lotto, I will build a large studio for quilters and give lessons accompanied by high tea. Oh to dream. 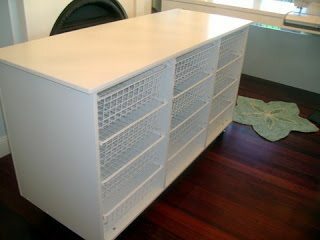 I had a cabinet maker build this pressing station with baskets underneath for fabric storage. It was built at waist height so avoiding bending. I covered a piece of particle board with the stick on ironing surface and laid it on top. 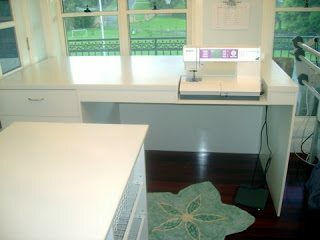 The sewing table is the same height as the pressing station. When I get more room these tables with positioned together. There is a insert in the table to rest the machine at table top height to provide a flat sewing surface. The drawers are large for storing notions and threads. I use a drafting chair to raise me to the height of the machine. I really like your pressing station. Great idea! Thanks Sandra, it is really great to press wide fabrics and lay out rows of sewn quilting blocks. If you are interested, I used a product called Giant Ironslide 2000 by Bo-Nash. It is 27" x 63" wide. Can you tell me where you bought the baskets for your pressing station?